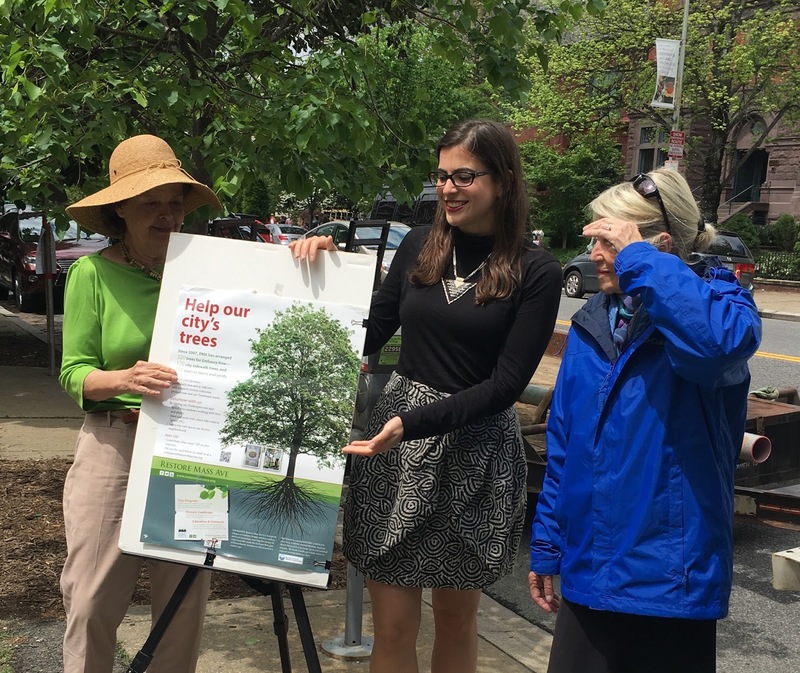 We held our first tree tour - a new way to teach Mass Ave neighbors about the trees and landscape features we have organized over 9 years and to thank our partners there who care for them so well. Some of the neighbors taking the tour had never met! Yet they shared their curiousity and LOVE for trees, while strolling on sidewalks they pass daily. It was a beautiful day . 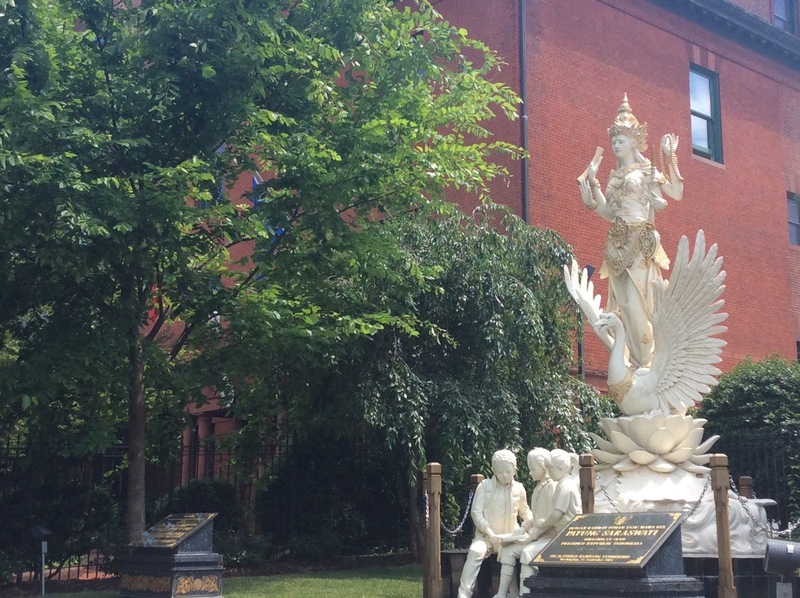 This tour featured the 2400 block of Mass Ave and also Emmet Park, the triangle park on Mass Ave between 24 and S Streets, recently re-landscaped by the National Park Service. Mass Ave resident Debbie Rider arranged the tour. RMA President Deborah Shapley served as guide. 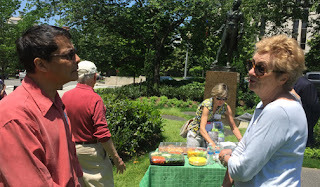 Saumya Mitra and Debbie Rider at the May 24 Love Our Trees Tour. Our Take A Tour page slideshow will help you count the ways to love trees on this part of Embassy Row/Mass Ave. What are those huge trees with year-round glossy leaves by the Chad Embassy (2401 Mass)? What are the curbside row and "second row" of trees whose branches close over the sidewalk by the embassies of Zambia (2419 Mass), Korea (2450 Mass), Côte d'Ivoire (2424 Mass) and the Venezuela Residence (2443 Mass). How to ID a sick tree? 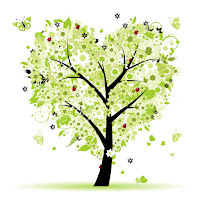 Check out our slideshow - and come to our next Love our Trees Tour! Taryn Farber of the DC Urban Forestry Administration helped identify the city trees on the tour; RMA arranges care for these trees. (Thank you, Taryn, for trimming some too-low branches over the sidewalk.) Board members Holly Sukenik and Rob Nevitt assisted. Treekeeper John Umberger took photos. 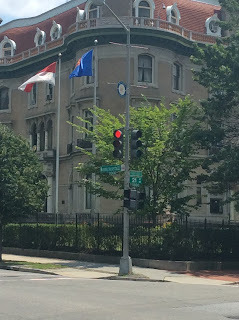 RMA made our program known to thousands of people who crowded the sidewalks of our part of Embassy Row, to be admitted to free Embassy Open Houses. Passport DC holds these wildly successful come-one-and-all events on two Saturdays in May with Cultural Tourism DC. On May 14 volunteers Melissa Kaminski and Sally Wiebe and Board member Holly Sukenik staffed our info table, at the park by the Estonia Embassy (2201 Mass). RMA got the city to create this space and plant a major tree. Anne Black was a special addition to our table crew; she and husband Steve Black maintain the park plantings. For the May 7 open house, RMA's table was by the Embassy of Indonesia (2020 Mass). The crowds were so dense that Treekeeper Lindsey Larson and Board member Claire Wagner moved our poster next to the street to take this picture. The Indonesia Embassy staff were welcoming as always. 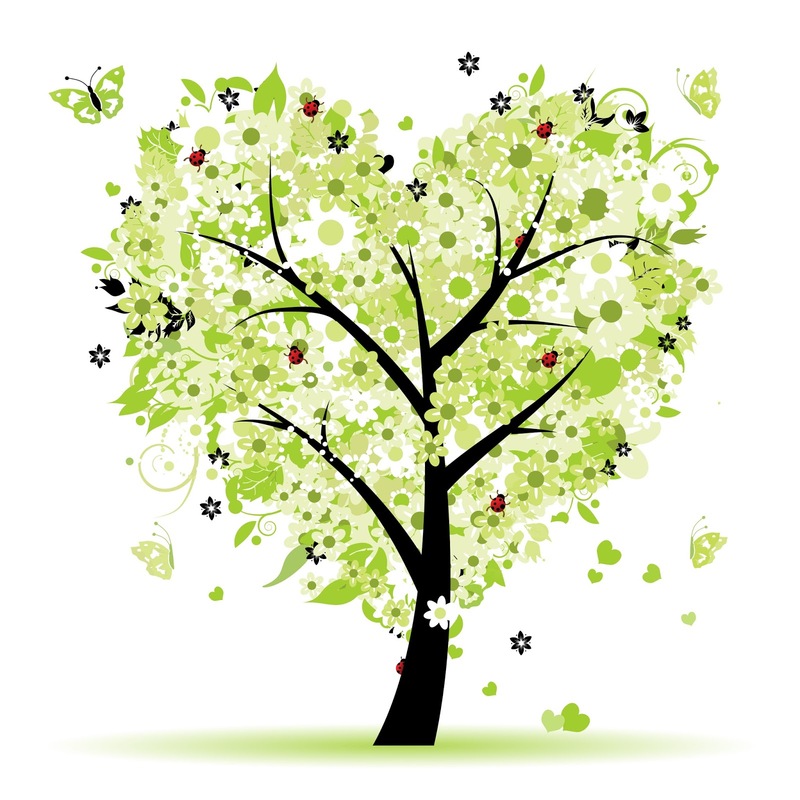 See our tree projects on your phone! Restore Mass Ave is a community nonprofit working to plant and sustain trees and historic landscape on Embassy Row in Washington DC. 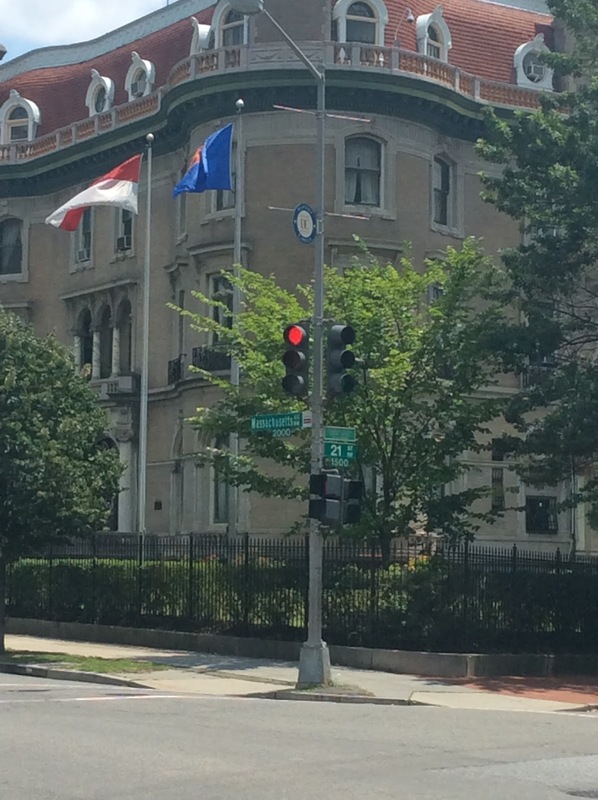 The 2 miles of Massachusetts Ave NW west from Dupont Circle ("Embassy Row") is one of the last "Grand Avenues" in the nation. 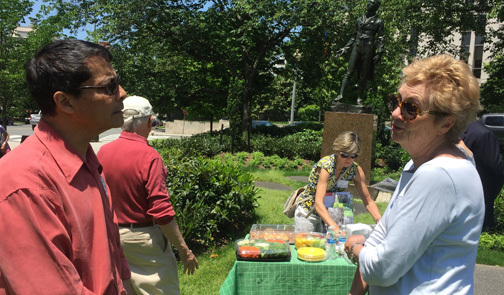 We enlist residents, embassies, and public and private partners to create a re-greened historic public space and national landmark. We spread knowledge of urban tree care through our Treekeeper workshops, plantings and media outreach. So far we've arranged ~330 new trees: ~170 from the city and ~150 privately, mainly with Casey Trees. We are supported by community donations. You may contribute at http://www.restoremassave.org/donate/. 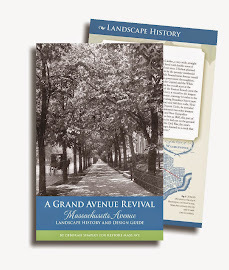 Enjoy RMA's guide to this "grand avenue"
Copyright Restore Mass Ave 2012. Powered by Blogger.